Thai’s celebrate new year three times a year. The first time they celebrate “international” New Year – December 31st. The second time, they celebrate Chinese new year – in February. And the third time, they celebrate Thai new year – in April. They really know how to take advantage of different culture’s holidays – maybe because they are such a fun-loving people. The Thai new years celebrations are very special and unique. It’s a huge water party. 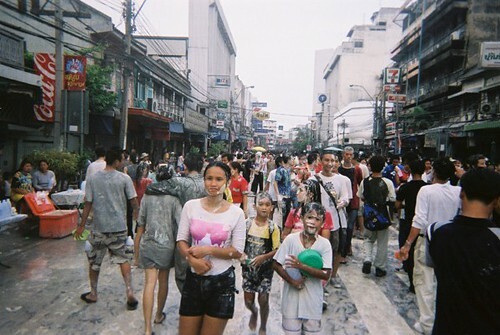 People throw water at each other on the streets and paint each others faces with a white paste. If you go to Khao San Road, Chiang Mai or Pattaya, you can witness (and voluntarily or involuntarily) take part in them. You will be drenched from top to toe, that’s for sure, and if you carry any valuables or electronic equipment with you, it’s vital that you secure it with several waterproof plastic bags. If you go on a Bangkok sightseeing tour in April, there’s a high likelihood that you will be able to witness a scene like that in Khaosan Road, the famous backpacker district. Both Thais and foreigners come here to have a lot of fun, and it really is a huge big party for young and old.